Shown above is a carved dark stained Redwood room number plaque mounted on a wood wall. This rustic room number plaque features engraved text, dark stained Redwood, and a Braille strip. These plaques and similar ones can be made of painted High-Density-Urethane (HDU) or stained and painted wood of various species (e.g., Redwood, Oak, Maple, Mahogany, Cherry) . This plaque is hand-painted and is clear-coated twice. . 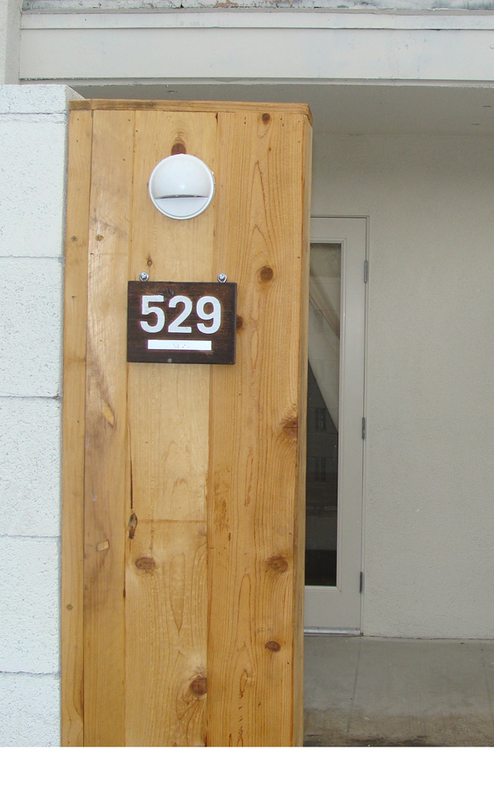 This room number plaque can be easily mounted with screws or epoxy on an outside wall (as shown) , a room door , or an inside hall wall next to the room door. To see over 40 examples of unit or room number plaques and signs for hotels, motels, inns, and B&Bs. please click on "Return to List" below right.